Art History Bloggers as "Les Indépendents"
As I’ve been mulling over these thoughts, I’ve begun to see some parallels between art history bloggers and the French avant-garde artists of the 19th century. Art history bloggers have decided to showcase their work in a forum different from the traditional publishing method in academia (i.e. print journals or academic textbooks). Really, one could argue that we have set up our own “Salon des Indépendents” online, similar to what 19th century artists did to break away from the artistic salon established by the Academy. 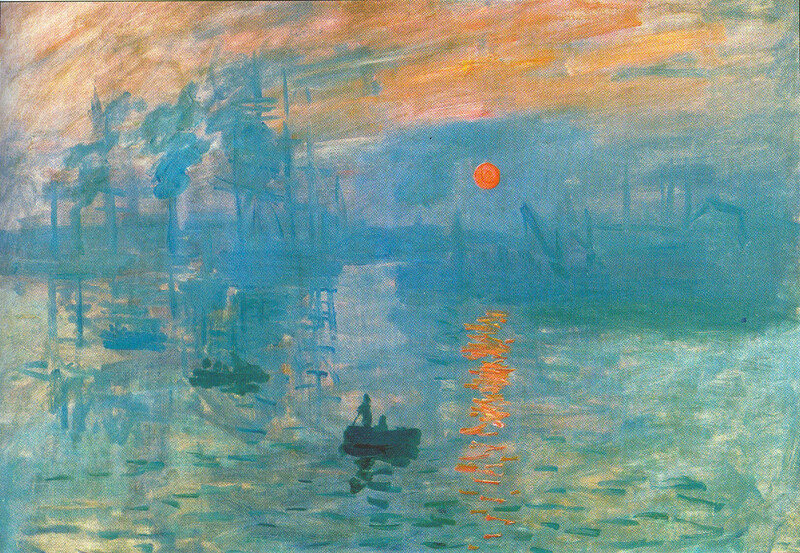 The informal writing style of blogs can parallel the choppy, short brushstrokes of Impressionist painters like Monet (see Impression: Sunrise, 1872 above). Maybe that’s why our work seems less appealing to those in academia: blogs seem unfinished and unrefined (perhaps just a mere impression of scholarship?). I also think that an informal writing style could compare with the color schemes found in some Impressionist paintings: lighter, pastel colors could be interpreted as less formal (or weighty) than rich, saturated colors. We can even draw parallels between plein air painting and blogging in a virtual world. In both instances, the artist/writer needs to be immersed in a specific type of environment. So, what am I saying? Am I predicting that blogging is going to rise up as an avant-garde movement to overthrow the academic publishing convention? Hardly. I don’t feel like I can be that prophetic. But it is interesting to think about how art history often values the “underdog” movements in retrospect. Even though the Indépendents/Impressionists were mocked at the time, they ended up being an extremely influential and important art movement over the course of history. And I think it’s safe to say that we, as bloggers, are also involved in a really great thing. 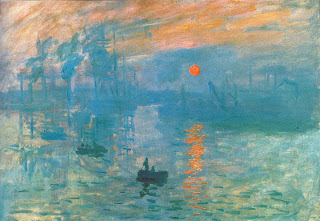 1 Anthea Callen, The Art of Impressionism: Painting Technique & The Making of Modernity (New Haven: Yale University Press, 2000), 21. Available online here. I love this comparison, and I think it is spot on. Brilliant comparison between blogging and Impressionism! Their immediacy and unpolished nature will attract younger audiences, too. M! The way you seem to post about things I am thinking about is always spooky! I was also thinking about this in more historical terms, with the tensions that formed between Humanism and Scholasticism. I wonder if some of those people in Academia that refuse to take blogs seriously are aware they are repeating the same patterns of behaviour that effectively led to the stagnation and the closing off of knowledge maintained by institutions(eg. church and monastic libraries) as opposed to individuals. It took independent Humanist researchers such as Petrarch, who were not 'school men' to rediscover a lot of the learning of Antiquity and use it to enrich the the basis of knowledge on which the Scholastic traditions rested. I think the format of the blog, with its interactive dialogue, and ability to link and reference material is the perfect medium to shape collaboration. I am not a university person in this field(art history), so can only point out that in the sciences, the blog format is not mocked or seen as a waste of time. Companies like Google and Microsoft encourage their employees or project teams to write blogs on what they are working on. It's a great way for them to disseminate information. Indeed, the most widely followed blogs in the word are science and technology blogs. As someone firmly sitting astride these two worlds, the quality and rate of communication in art history in particular is archaic in comparison to the sciences. Luckily, we have people like you to change this M! I wholeheartedly adore this post. It's a very intriguing comparison and one which makes a great deal of sense to me. I recently graduated with an art history degree and have heard several professors write off blogs without a thought. It's not 'real' scholarship, or something. But for me, there are many blogs I read that are much more enjoyable and posts that stick with me far longer than the dry, wordy prose used by 'real' art historians. For people interested in art but not studying it professionally (or even those who are), I imagine it's much more likely that they would actually read and engage with something like this. It's entertaining. It's not intimidating. It speaks on a level comprehensible by people without fifty years of art theory, Arthur Danto, and Foucault under their belt. That intimidation factor is something I feel art history, and perhaps to some extent art as a whole, sorely needs to address to remain a vital part of the world instead of a struggling remnant of bygone days. Would blogging also go hand-in-hand with the "de-skilling" (as one of profs liked to call it) of modern art? In class this morning, one of my professors (not the same one) called art history retarded, because it tends to be a very conservative discipline that's slow to change. Maybe that's why there aren't many art history bloggers and why we feel so marginalized. As always, thanks for the comments (especially to newcomers!). Hasan, I think your ideas about humanism and scholasticism are really interesting! I can see parallels with that as well. beth, I loved your comment. I thinking blogging is a great way to show people that art history is approachable and interesting. But I think we'll continue to come across as stuffy and snobby if we don't latch onto more approachable ways to communicate information (both in actual language and in the way that information is communicated, like blogs). I don't think we need to always "dumb things down," but like you said, art history doesn't need to be stuffy! @Heidenkind! That is an interesting comment made by one of your profs – I contemplated a similar word but went with 'archaic' instead because it really is an outdated approach, this "publish or perish" business. I must admit, I have gotten a taste of the marginalisation being described. For my interview with Alex, there were *a lot* of people who sent me some really excited, positive feedback. There were also a few people who did the exact opposite, and they were from established institutions, both academic and online. I'm not sure about how others respond to such prodding – all it makes me feel is more enthused to keep doing what I'm doing. The people who get alreday reap the benefits, in terms of sharing of knowledge and making meaningful connections. The stubborn types will eventually *have* to join in, or wither into obscurity. The government cuts and dwindling participation in the humanities is down to this cadre of people partying like its 1899. Monica, I totally missed this discussion until Hasan pointed it out. Thank you for your reflections. I think it's a beautiful parallel. I would like to add that I never thought of myself as an "art history blogger" but simply as an art historian, who also blogs. And my blogs are "travel and art" related so i say i'm a travel writer. Certain detractors seem to think that we wish to replace academic publishing with blogging. I never said or thought such a thing, and I don't think any of "us" has. I've been thinking about this "whole thing" too, in particular related to Hasan's question about what we can do to promote more art history blogging. (You may recall I wrote "Does art history need to have a stronger presence online?") Here is an answer in its infancy. I'd like to see a visual breakdown of content on the internet. A lot of it would be related to tech news, real news, general crap… how much of the internet pie is dedicated to the HUMANITIES? Probably not much. How much funding, be it national or institutional, is dedicated to the humanities? why is that amount low? It seems to me that art history blogging is a factor in keeping this discipline accessible and actual for a general public. And if more potential students become engaged in this way, we're doing a favour to the discipline itself, keeping interest and enrollment up, which in turn results in funding. It's just a theory. I"ll flesh that out for yall soon. Thanks for this comparison. The art history blogosphere has become such a cozy Grenouillère. This is a good thing. Alex, it would be interesting to see a visual breakdown of content on the internet. How much is related to the humanities? Not much, I bet. But who bring up a good point: maybe we bloggers are helping to keep the discipline more approachable and engaging, which IS keeping up enrollment and interest in the arts. It would be interesting to see if a study could determine the effects of art blogs on the humanities. Thanks for your comment, pontecommedia. Our blogosphere has become cozy, hasn't it? If it helps, most academic disciplines have a rather low regard for "popularization", mainly out of what I suspect to be conflating popularization and dumbing-down. The humanities just suffer more from it because the mysterious men in white lab coats can show physical objects for their work and we can't. One other thought-why is art history conservative? is it something inherent to the discipline or more to do with the age of most art history professors? Also, is it just me or are museum people much more likely to have blogs than academic people? Any movement where the members saw themselves as "les indépendents" would provide a great comparison: more modern, more rebellious, less traditional, better use of technology, less respectful to authority figures etc etc. The French Impressionists of course, but consider the Viennese Secessionists or even the Arts and Crafts people. I have no problem with the informal writing style of blogs, even what you call an unfinished and unrefined informality in writing style. And I don't mind brevity either. But there is still a requirement for accuracy in facts, clear English, proper citation of sources etc. In other words being modernist does not reduce standards in art history writing. Another issue is "peer review". Those aiming for tenure have no choice but to submit their work to a magazine that will not publish their work unless it is approved by at least two other scholars. This process ensures that no truly original work gets through. Yes, a little insight here and a little insight there is welcomed by the gate-keepers but insights that makes their own articles and books appear mistaken will be quickly rejected. Not only does it take time to digest major contributions but they are particularly difficult for people already in the field to accept. They are so used to the paradigm in which they work that they cannot see the weakness in its foundations. That is why, as I read once, most major insights come from outside a discipline, not from within it…either amateurs like Darwin or the many doctors who have seen anatomical shapes in the Sistine Chapel. Great comments, everyone! It's really fun to read these. Douglas, I'm not surprised that most academic groups shy away from "popularization." Art history is just one of many disciplines. You bring up an interesting question, though: why IS art history conservative? I think it might have something to do with the age of professors. I also think that art history is struggling to become less conservative (which ties into the tension between the "new" and "old" art historical methods). Perhaps it's also because art history attracts a large number of white females from middle-to-upper class backgrounds? Hels, I think you are right: art history blogs can (and should!) be scholarly. It's important to disseminate accurate information. (And I think that we, as bloggers, have a responsibility to help correct inaccurate information, should we come across it.) I like your idea about modernity and other artistic groups. In fact, your comment about technology made me realize of a further comparison I could make between bloggers and the 19th century painters of France. Many of these painters embraced new technological/scientific advances in their own way, since they used paints that were manufactured in tubes (a new feat at the time, thanks to advances in science and chemistry). Likewise, bloggers need to embrace new technology in order to create their own work. Family Album, I think you are right about how a "peer review" can sometimes squelch new ideas from being distributed (not because the ideas are "bad," but simply because of political reasons). Although I think that there is great value to having peer-reviewed journals (especially to ensure that information is accurate), there do seem to be some detrimental side-effects. I like this analogy between impressionism and blogging a lot. It’s a useful thinking tool for analysing the problem of blogs in relation to formal academic structures. Blogs as sketches, rather than finished paintings, forcing us to create salons and groups of our own on the net to get acceptance, or just acknowledgment. But remember Manet wouldn’t give in; he strove to get his work accepted in the official salon, and won through a number of times even though he suffered great humiliation. A La Gren cosy blogosphere is nice, but Isn’t there a danger that we could get too comfortable with our marginality? Having said that, from the comments on this thread, I can see that people want to use the blog format to reach a wider public, and though it took time, the impressionists eventually did just that. Maybe we should collectively draw up a blog charter stating what we expect an art history blog to be and do. How rough-hewn or polished should a blog be? We could consider factors like target audience, style, tone etc. I’ve always wanted to do more research on art history signatures and presences online, but my workload has always put paid to that. H. Good description of blogging as the opposite of a monastic, scholarly clerisy intent on keeping knowledge, and the means of divulging it, to itself. Very medieval. Getting far from impressionism now, but a renaissance of on-line thinkers modelled on humanist individuals with a civic outlook- that’s good. There isn’t really anybody like that in art history, somebody who can represent the discipline to a public wary of the academy. This seems to be a function fulfilled by TV presenters, Kenneth Clark, Simon Schama, Collings, but art historians generally steer clear. Family Album. Peer review is a real problem, and I think it’s forcing scholars who think outside the box to publish outside the usual channels. The print/digital debate is another factor, driven along by problems of money, space, resources in libraries. It makes economic sense to think of alternatives to print publishing, but I think most art historians are disdainful of using the web in this way. This is very healthy discussion for art history to have. Keep it up everyone! I am pleased that art historians like yourself others present here are excited by this discussion! I will also be doing a piece on art history blogging in the near future, tracking the progress of the art history blog since the Art History Newsletter's fateful "Why do so few art historians blog?" post back in 2007. I think a great deal of this has to do with a generation gap and lack of technological awareness. Is it a coincidence that science and tech blogs are so far ahead? Of course not! These are people predisposed to using(and making!) technology and conquering the logistical puzzles associated with making an online presence viable. One thing that is heartening is that modern students will not have this disadvantage – the print or perish crowd will need to make way for the tech savvy youngsters eventually. I am of an age where I only had the web available when I started university in the mids 90s. I think anyone who finished university *before* this date, particuarly in the humanities will struggle with keeping up with advancing tech unless they have a deep personal interest in it. As for investigating the presence of AH online, I know someone looking into that, but can't say much else at the moment! Great comments, David and H Niyazi. I think David brings up a good point – we don't want to get too comfortable with our marginality. I especially wouldn't want the scholarship to suffer. If we want to be taken seriously, we need to avoid getting too comfortable. H Niyazi, I also think that blogging will help reach students and individuals that are tech savvy. I also think it's important for classroom professors to keep current with technology too – I've noticed that students learn a lot when I incorporate technology into our classroom lectures (with image databases, YouTube clips, online articles, etc.). Art history bloggers, lecturers, and students all benefit by keeping current with technology. I treat my blogging about art history as a fun endeavor. Regarding the low opinion the art history community has when it comes to blogging, I can see where they come from, but at the same, I do not really care. Like I wrote earlier, I am doing this for fun. I also do this because I love art history. Furthermore, I think when done well, blogging about art history can lead to some interesting discussions. Catherine, I'm glad you brought up the topic of blogging being fun. I think that most art history bloggers choose to blog because they have fun. For me, blogging about art history isn't always about seriousness either (although I am serious in presenting accurate information). Not only do I think the writing and researching processes are fun, but I also have fun engaging in discussion with others. It sounds like you have fun engaging in such discussions too! m, what an interesting post! i'm glad i read it. i never would have thought of those parallels.